This summer has been focused on building skills both on the track and off. Jason is working on driving and being a kid, and I am working on the kart and being a Dad. Part of this skill building means that sometimes we are pushing the limits personally and technically. So far we have had an great time at the races with some bad days, at some point we where bound to have a day that was just not good and not fun. This week we joined the ranks of oval street racers at the Belvidere Heritage Days kart race (News video with Jason). For the most part it’s the same as sprint racing, except there are only left turns, the tracks are shorter, and the karts are really close together. Since we don’t have an oval kart we removed the pretty green body for some R&R and put on a tougher body. We also moved the front right wheel out and put a 6″ wheel on the rear and eventually moved it out as well. This gave us a kart that sort of looked like an oval kart and should be able to come close to being OK for oval racing. Oval karts are much lower and have very wide wheels in the front and the back right side and the seats are laid back. Jason and his kart would be no match but he was not the only one in a sprint kart. Even so he was hitting 30+ MPH on the very tiny straight and doing 8-9 second laps. Practice went very well. He started off slowly as he sorted out the the odd kart and new track but quickly picked up speed as he got into a rhythm. Lleft, left, brap, left, left, braaaap and again. After making a few line adjustments he was keeping up with the oval karts and even occasionally making a pass. He was definitely having a good time judging by the grin on his face. The track itself was a little rough. There were two fairly big bumps from expansion lines in the pavement, and putting up with these was going to be one of the many factors of the day. Heat 1 started off great after a false start. Jason took off and dropped to third but then made a good pass for 2nd in the second lap. 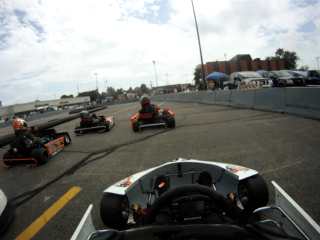 He held that position for a few laps until an oval kart reeled him in, eventually staging for a pass. Except, instead of passing Jason the oval kart stuck just a bit of his nose in Jason’s line and bumped Jason around. Jason pulled off and I sent him back out because he and the kart were not damaged. He was given the 4th spot and the other guy 5th. At the green they were off again – Jason gaining on 3rd with the guy behind doing the same, and once again tapped Jason in the back sending him in to a spin. Jason headed to the back of the pack. It was going to be a green, white, checker to the finish, just like NASCAR. The green dropped and Jason pushed hard but came up just short of 4th place. This set the stage for Heat 2, Jason in 4th and his nemisis in 5th. At the start it was obvious that Jason was holding back – letting the oval kart by and not chasing him. It seemed his plan was to stay out of the way. A few laps in, the yellow flag flies (we’re still not sure why) just as Jason and #11 pass #25. There was some confusion of the line up for the restart but eventually they get it sorted out and Jason was in 3rd, #11 in 4th and, #25 in 5th. At the start Jason took off. #11 was slow to start but caught Jason, gave him yet another tap, pushed him out of the way and passed him in the last lap. Jason was clearly frustrated. Jason started the feature just the way he finished the second heat – in 4th place. He gave everyone a wide berth and went straight to the back. In the 6th lap he clipped the inside curb of the track and it stripped the wheel from his hands and he drove straight into the barrier. At that point regardless, of the condition of anything he was not going to get back on that track, his day was done. Thankfully, he was uninjured except for a strained thumb from the steering wheel. This was one of those days where we reached a bit far. Luckily for Jason the only thing damaged was his pride (and a thumb for a few days) but that was cured by a chocolate shake. I like to think we learn some new skills. The kart seemed to work pretty well and when Jason was going all out, he was pretty solid. I don’t have any reason for regret but I do with this race could have gone better and been more fun. We were going to head to Durand for another oval street race but based on our experience in Belvidere we decided to skip it. Instead, we rested and are preparing the kart for Jason’s favorite track, Grattan Raceway in Michigan, for the 2nd race in the Championship Enduro Series. This next race is going to be about fun racing and fishing. Thanks this week thanks to Lance Anderson from Leetzow Raceway Park for putting this race on. We should make the effort to race dirty time. To Bruce at Atomic Decals, thanks for coming out and supporting us. And Karen my wife and mother of our children, thanks for not freaking out and putting up with our post race buzz. We usually have more time to calm down after a race, but I guess 45 minutes is not far enough away.